Corporate Lands - Eklutna Inc. Thank You For Respecting Eklutna, Inc. Lands! Eklutna, Inc. property holdings stretch from Anchorage to Eklutna Village. 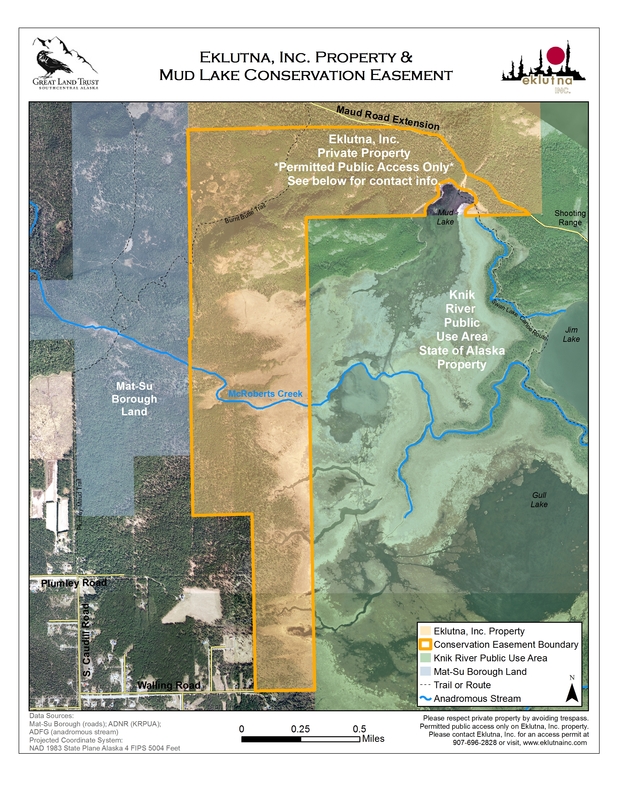 Eklutna, Inc. also owns land in the Matanuska-Susitna Borough and Jim Creek area. Please avoid trespassing! You can avoid trespassing and being fined by checking for Eklutna properties from Eagle River to Eklutna as shown on the maps below. Please note: Ice climbing is not allowed on Eklutna, Inc. property. Visitors who want to access Eklutna, Inc. land need either an individual or a corporate permit to do so. At this time Eklutna, Inc. is only issuing individual permits for foot traffic. Hunting and or fishing is prohibited unless you are a permitted shareholder with Eklutna, Inc.
Click HERE to download an Individual Permit form. Click HERE to download a Corporate Permit form. Please read the instructions in the permit forms carefully. Please bring the completed forms to our offices on 16515 Centerfield Drive, Suite 201 in Eagle River to have it legally signed and embossed with the Eklutna, Inc. seal. Please carry the original form along with your ID at all times when you are accessing Eklutna, Inc. lands. Unauthorized use of Eklutna, Inc. lands is prohibited and trespassers will be prosecuted to the full extent of the law. Our lands are inspected on a regular basis to prevent unauthorized use. In January 2017, Eklutna was transferred 22,207 acres of land by the Bureau of Land Management (BLM). This area, Eklutna Conveyance Area South, is south of the Knik River as shown on the map. 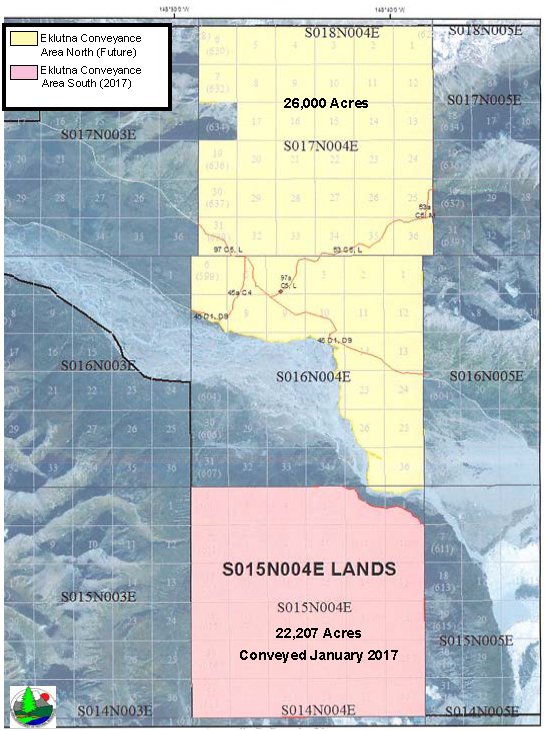 The BLM approved conveyance of all lands on the map in 2015, but the State of Alaska appealed the decision because of differing opinions about easements across the lands. All parties eventually agreed that the south portion could be conveyed, but the northern lands, shown in yellow, have been held up due to discussions about which easements will be on the patented land. Eklutna and the State have come to agreement about the easements and are awaiting the BLM’s approval. The northern area is approximately 26,000 acres and should be conveyed later this year.